Apparatus set up to measure the increase in temperature when the different fuels given are burnt. This must lead to a comparison of the results for the four alcohols. The change in mass is equal to the mass of fuel burned. For each experiment, calculate the change in temperature and the change in mass. How is the temperature rise of water related to the number of carbon atoms in the alcohol molecules? Describe and explain three improvements that could be made to the method to obtain experimental values closer to the theoretical values of energy released. would reduce the heat lost after it is transfered to the water. They could use a better conductor, so use a copper can instead of glass beaker - this would allow more heat to be transferred to the water. Wrapping the equipment in insulation or at least putting a lid on the beaker would reduce the heat lost after it is transfered to the water. 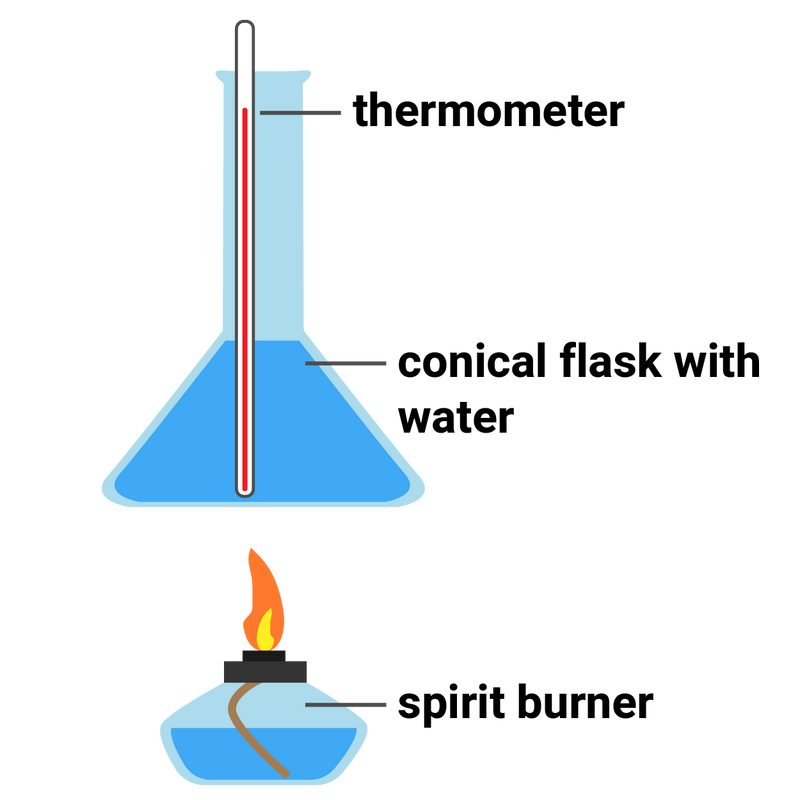 The student should reduce the heat loss between the flame and the beaker by enclosing the apparatus/surrounding the equipment to recuce any drafts. They could also use a better conductor, so use a copper can instead of glass beaker - this would allow more heat to be transferred to the water.